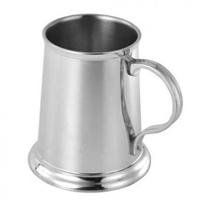 A selection cups and tankards made from Sterling Silver or Fine English Pewter. Ideal for Christening Gifts. 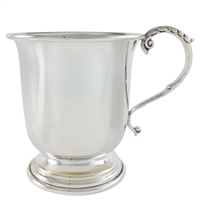 Sterling Silver Georgian Style Christening Cup. British Made. Solid 925 hallmarked sterling silver Georgian style children's Christening cup. British made. 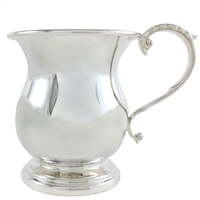 Sterling Silver Straight Sided Christening Cup with Acanthus Leaf Detail. British Made. Solid 925 hallmarked sterling silver straight sided children's Christening cup. British made. Beautifully made by the very highly regarded Royal Selangor this traditional gift is sure to please for many, many years. The plain surface makes it easy to be engraved on. A beautifully made children's mug presented in a dark wood finish wooden presentation box. Fine bone china, made in England. Beautifully detailed with a different image to each side and finished with gold and platinum detail. 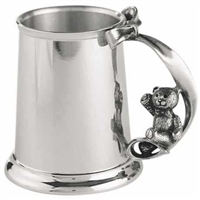 Hallmarked Solid 925 Sterling Silver Childs Can Christening Tankard Cup. Plain and Suitable for Engraving. Gift Boxed. Made in England.